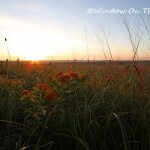 A couple weeks ago we visited one of our favorite places, the Tallgrass Prairie National Preserve. 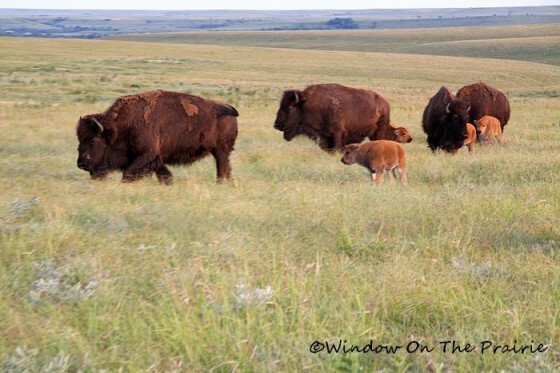 We had heard that there were five new calves in the bison herd and couldn’t wait to see them. 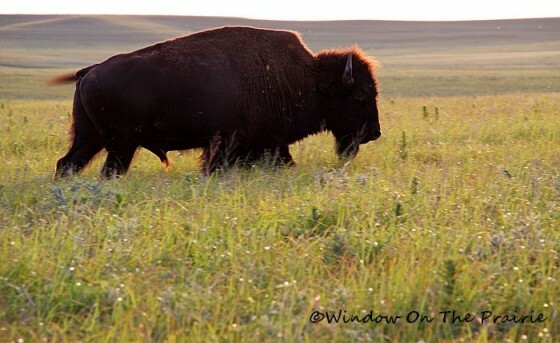 In the late afternoon, we parked our truck in the lot near the visitor center, applied sunscreen, put on our hats and photo backpacks and walked in. 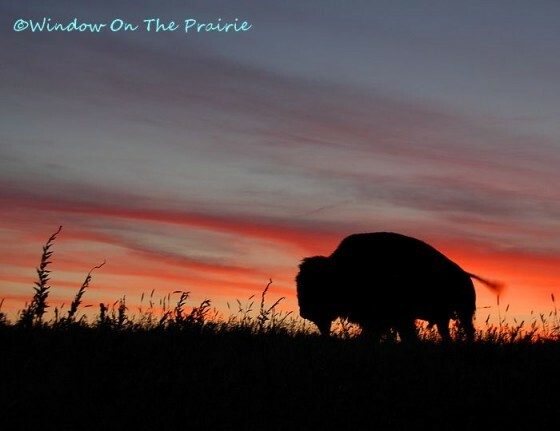 Usually it is windy on the prairie, at minimum there is a breeze, but that day it was still – so still we could hear greater prairie chickens calling in the distance. 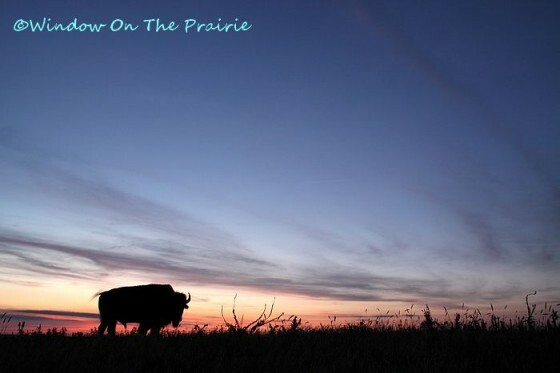 The sun was hot, but the prairie birds, dickcissels and meadowlarks didn’t seem to notice as they sang out merrily across the prairie declaring their patch of territory. After several miles of walking in the still heat, we were worn out and ready to give up finding the herd. 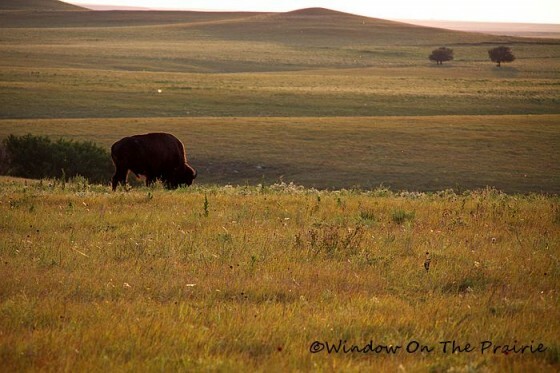 It was getting close to sunset when we topped a hill in a last attempt to catch sight of the bison. And there they were, grazing in the lush grass of a valley. We dropped our packs and sat down for a bit to rest. 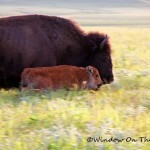 We peered through our long lenses, and sure enough, there were the little calves, all born within the last few weeks. 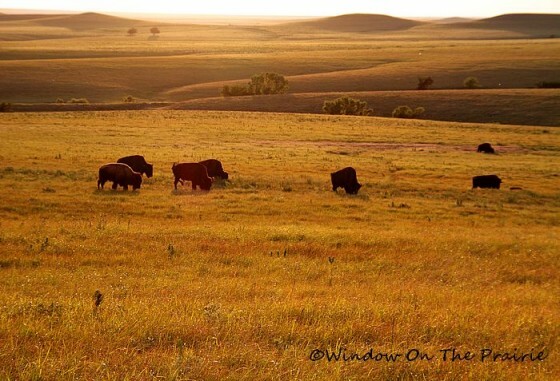 Back in October of 2009, seven bulls and six cows were turned in to an 1100 acre pasture on the preserve. 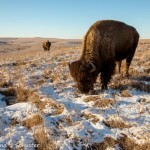 It was the first time bison had grazed on the property in over 100 years. 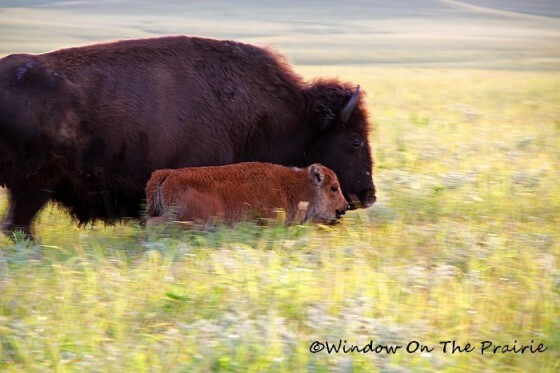 In the spring of 2010, one calf was born, the following year two, and this summer five. We are so excited to see this many calves this year. It is hoped the herd will eventually number between 75 to 100 head. 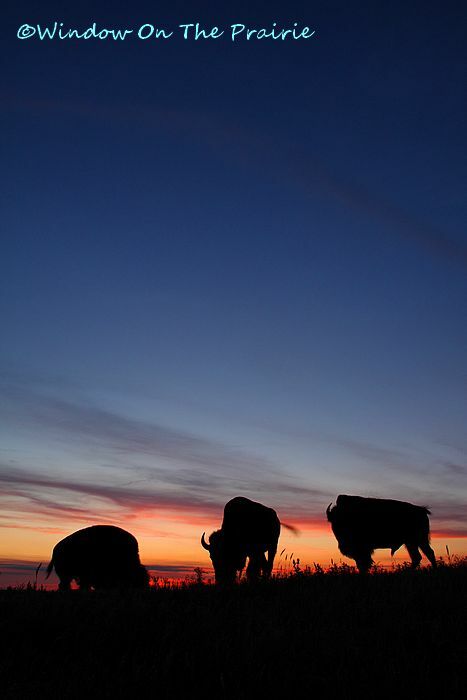 We watched as the herd walked slowly by us, passing between us and the sun. 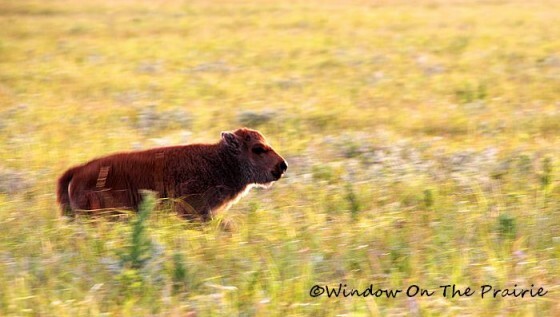 Then, just as the cows and calves had passed us on their slow walk, one of the calves broke into a run. 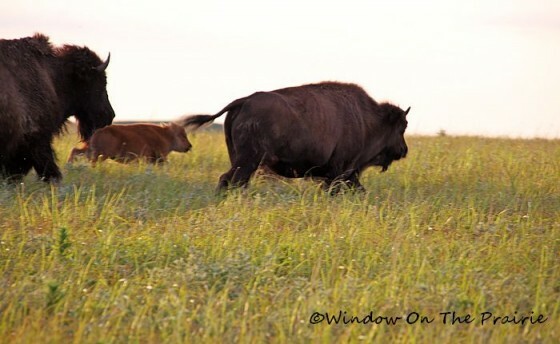 The rest of the herd joined him, and we watched as they thundered away from us, tails flying out behind them. Finally they settled down into the next valley to graze. We watched as the sun set and evening settled in. In the quiet darkness, we walked back to our truck ……. 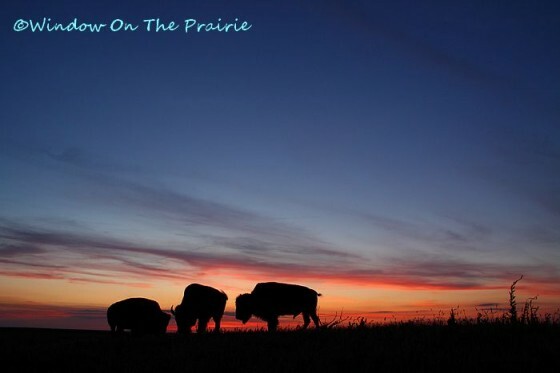 just us two, the prairie, and the growing herd we left behind us in the valley. I envy you and Harland and your travels! I have saved several of your pics for my desktop, as a reminder of what I’m missing. Thanks again for sharing. 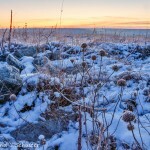 Was this area a trail for covered wagons? You are able to capture the beauty of life, in your photos, what a gift. Were you ever afraid the bison might run over you? You know, I lived in Missouri for thirty years and never heard of this place in Kansas, until I learned of it from you, Suzanne. Thanks so much! Don’t know if there were any trails in this area. I don’t believe so. 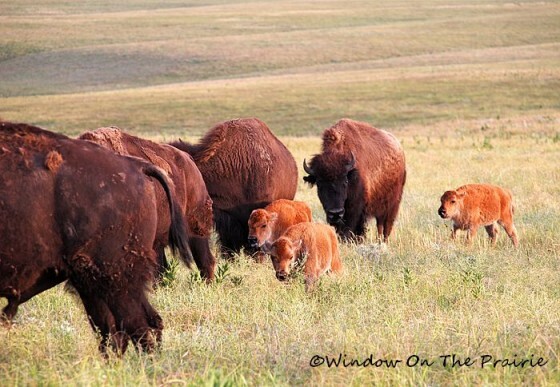 The bison were past us and heading the other direction when they began to run, so we were ok. Thanks Carol! 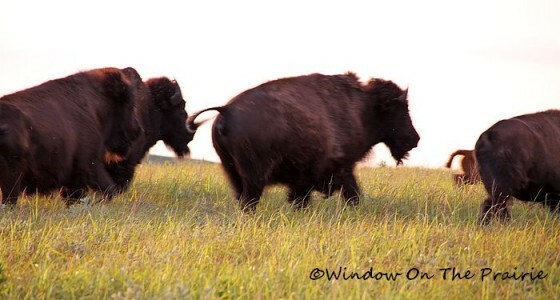 The sound of a buffalo herd thundering by is magnificent. Did you happen to capture it on video in addition to the still photography? No, I wish I had. Awesome pictures, you’ve captured a true sense of the primeval. Except for the first picture I can see no sign of man. It’s like looking through a window back in time to before even the Indians came on the scene. You expect to see a pack of dire wolves , cave bear or a mamoth in the distance. Oh my goodness! How envious I am right now! It must have been quit a sight to see. 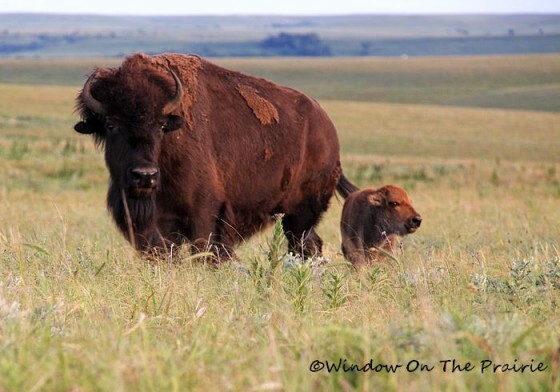 Out on the open prarie with the buffalo. Just like a dream. I have been away from your posting but so glad to be back! Simply amazing. A sight I would die to see. Thank you so much for sharing. 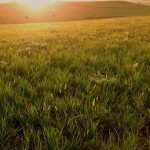 Incredibly beautiful photos, thank you and Harland for sharing. Your generosity defines you.